Cats tend to get up really early in the morning and I’m no exception. After I eat, I like to sit on my prayer rug in the window and snoopervise whatever is going on out there. I’m often witness to the sunrise. 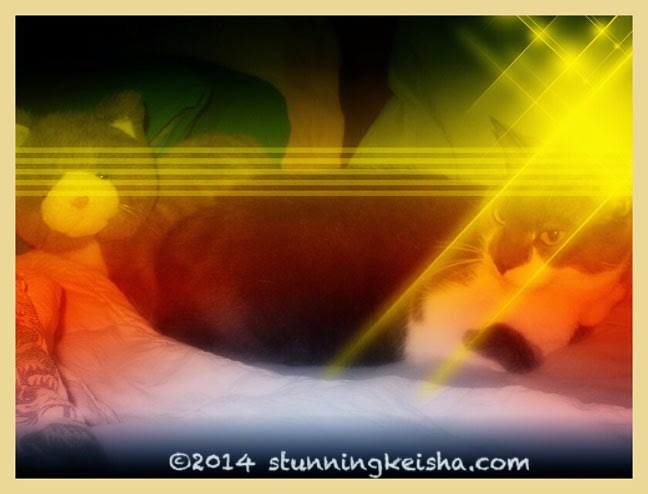 Last weekend, TW happened to spy my sunrise and ran for her flashy box. She couldn’t get over how gorgeous it was as the morning sun fought to make it through the clouds from the rain we’d had the night before. As luck would have it, this week’s PhotoHunt theme is Clouds. In these photos of the sunrise, it appears the clouds are on fire. TW wasn’t sure she could do the colors justice through the window glass. Do you think she did a good job for once? Color me impressed. 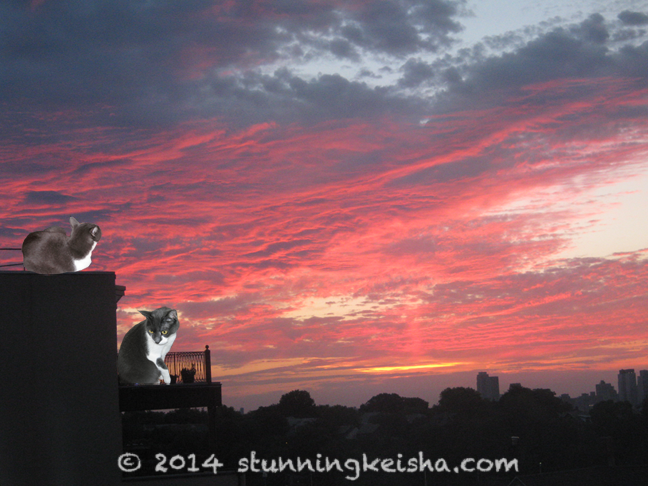 In keeping with the Clouds’ theme, I’ve found two effects for my entry in Athena and Marie’s Caturday Art Blog Hop. This online effect is called Sunrise. In my stunning opinion, the colors aren’t nearly as impressive as our own sunrise. Below is a PhotoShop effect called Different Clouds. I don’t see the clouds—it looks more like smoke to me—but will leave it to debate. Perhaps if I permitted TW time to explore it further, she could have experimented some more. It started out as a very underexposed photo of myself sitting on our hall rug. TW lightened the exposure by using the auto tone correct. This left it grainy but at least you could tell what it was. To me, this Clouds filter looks like a mess but there is an unmistakable stunning cat face in the center. Cats always get yelled at for waking our humans too early in the morning. Do we ever get thanked when they get to see gorgeous sunrises like the one TW photographed? The only sunrise Mommy ever sees is if she works a grave shift the night before! And CK, we keep our house at 71-72 during the day, and 68 at night. Luv dose pretty pink clouds! Wow, what a stunning sunrise! I'm not sure my human has ever seen a sunrise, unless she was up all night! BOL being a bedhead myself I am never up in time. Stunning sunrise there CK. Have a super Saturday. This is such a gorgeous sunrise. TW did do great job capturing such beautiful moments! I like your clouds effect very much. Very unique! Those clouds are totally amazing CK!!! Mum prefers sunset because she's a night person, but ever since she adopted me she gets to see the sunrise now as well! I would say you did the colors justice, despite the window. Beautiful! By the time Mommy wakes up, the sunrise is long gone. And now that the Commonwealth Games are going on, Mommy and Daddy have been going to sleep at sunrise. The rare occasion Mommy gets to see a sunrise. Haha. What a great theme picture and lovely post. I think it is very safe to say TW is and artist! The Staff doesn't do sunrises!! But that one is spectacular!! I've seen a few, but my lack of thumbs means no pics! Wonderful cloud photos CK! You are right, the colors in the online aren't near as beautiful as what TW took! Dat is a purrty sunrise. We get up early all year long. Mum only gets up around sunrise during the fall and winter! Oh wow!! That sky is absolutely gorgeous!!! One time, Mikko woke me up by walking over my face, his paw jamming into my eye. And he has claws. Ouch. Anyway, I wasn't getting back to sleep, so I decided to go out onto my porch. Mikko wanted out, so I put on his harness and his leash, and we went outside. When I looked into the sky, it literally looked like it had a hole in it. I took a picture on my old phone, but I dropped it into the sink when I was doing the dishes. Life lesson: Do not talk on the phone while doing dishes. Anyway, have a pawsome day! That sky is furry impressive and beeyootiful! The kitty face is the best part of that last picture! Why don't the Humans unnerstand that we are PURRFECT and need no clouds or other tinkering?!? The Human seems to think sometimes she can actually make me look "better"--as if! Love all of your effects! 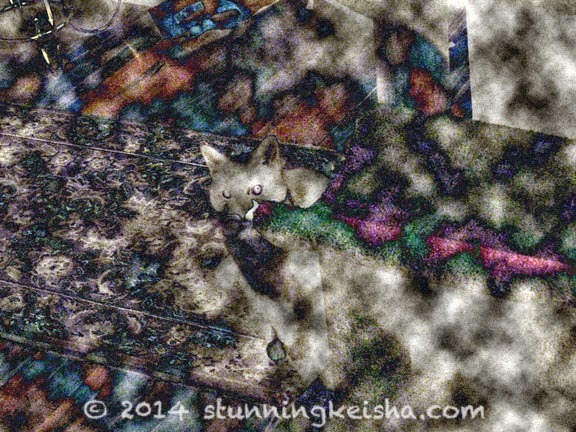 And yep I see that stunning kitty in the center of the photo! Haha! Amazing sky shots - really - the colors are fabulous!!! Thank heavens there is no fire - just "fireclouds" !! Wow. LOVE the sunrise photo and the gif, outstanding!